At the first possible moment, you drop that stupid name tag like a bad habit. 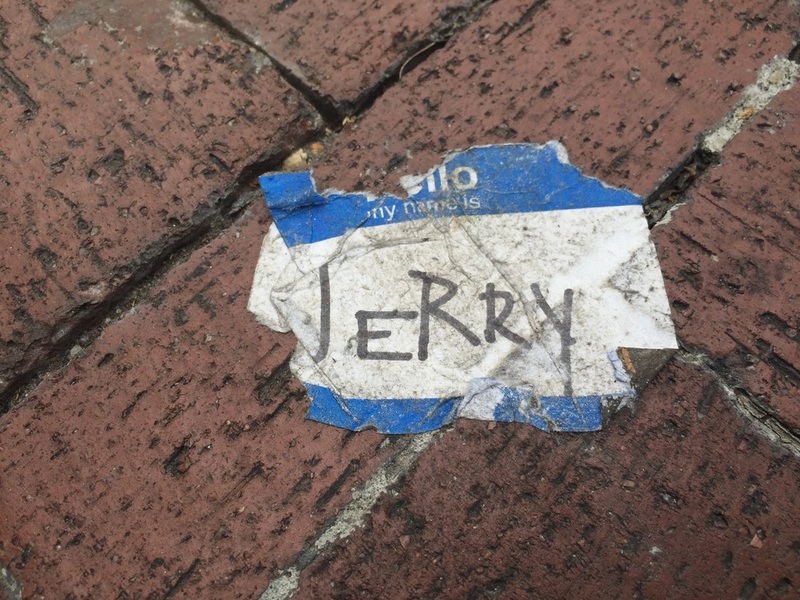 No longer will you shoulder the burden of "Jerry". For the duration of this real estate sales seminar, it is as if the last thirty-one years of your life never occurred. You sprung into existence here, in this place at this very moment, fully formed and freaking awesome. You are a man out of time and place. You are THE man out of time and place. You are unbound by identity. The shackles of your past self are broken, and you are running through golden fields of obscurity. The rush of your instantaneous anonymous existence is exhilarating. A newfound confidence washes over you like a warm sea, and baby can you ever swim. Drawn by the outrageous beams of positive energy you exude, a woman approaches from across the lobby. Her long brown hair falls in waves over her slender shoulders. She wears an inviting smile under striking green eyes. The name tag on her shapely bosom greets you with "HELLO" and advises that "MY NAME IS Shelby". "Hey there stranger," she says flirtatiously. Glancing your discarded name tag, she points at the spot it occupies on the carpet. "Looks like you lost something." "I've lost nothing, Shelby, you reply. "I've gained the total freedom only a nameless man can have. If I don't exist, none can hold power over me. Join me, Shelby! Cast off the bonds of your identity and join me in the void!" "Cast off my bonds?" she says, shooting you a knowing smile. "Can't you at least buy me a drink before we get that intimate?" "Shelby," you say, gripping her shoulders, "I can do ANYTHING." You use your newfound power to buy Shelby a whiskey sour. After a short conversation, you find that you have nothing in common.